If you ever need an example of the level of competence within CBR here it is. A newly redesigned and injection moulded dropout to replace the original Look design. Why did we change it? 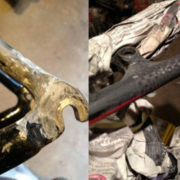 The left picture shows the original carbon dropout which is poor frankly. 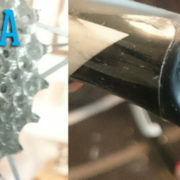 You can’t, without considerable risk, re-align the hanger without snapping the carbon dropout because there is NO support from the skewer when the wheel is fitted. There is too much reliance on the strength of this carbon section when, in fact, it needs to be less exposed. 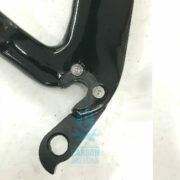 This repair was for a Swiss client who loves the bike but after trying to repair it we gave up and suggested that we re-design the dropout to a different hanger system which he can replace as per normal if the hanger is damaged. 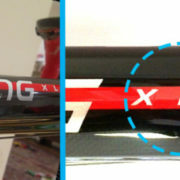 I don’t criticize the rest of the bike or the company but in our opinion this design, like some other manufacturers, have fallen short in this department. I would like to hear from Look as to why this is so. It is possible we have missed something obvious. I would be happy to share that update with you all in due course.